I have recently reached stalker status. Yup, this BSB is a class A stalker. It’s funny how love will do that to you. I’m in love, I’m in love and I don’t care who knows it. I find myself constantly checking twitter to stay up to date on my new love’s whereabouts. But it’s not unwarranted. My new love is sweet and comforting and makes me blissful. So, who is this new love you ask? You may be surprised to hear he’s not a he at all. He’s not a she either. My new love is a truck. Well, an ice cream truck to be exact. But, this is no ordinary ice cream truck. 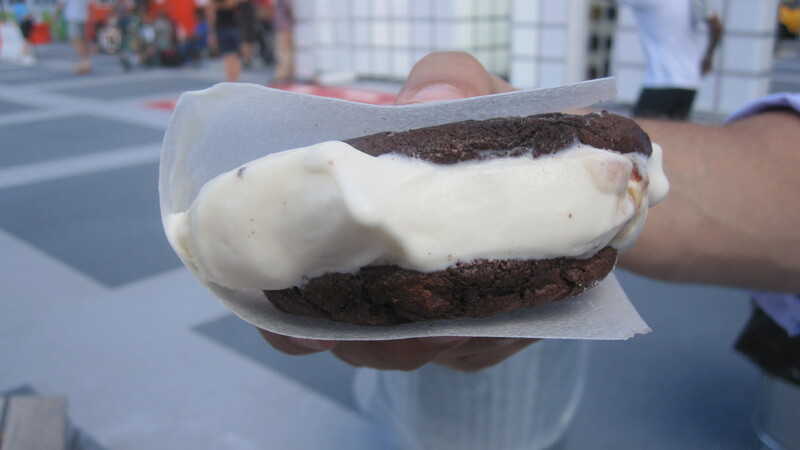 I’m talking about the Coolhaus Ice Cream Truck, driving in a new era in ice cream…The Era of the Ice Cream Sandwich. These aren’t your typical ice cream sandwiches, no offense to the old school chipwich. But, once you go Cool, you never go old school. Yes, I just said that. I know, I’m a nerd. I’m totally Cool with it. 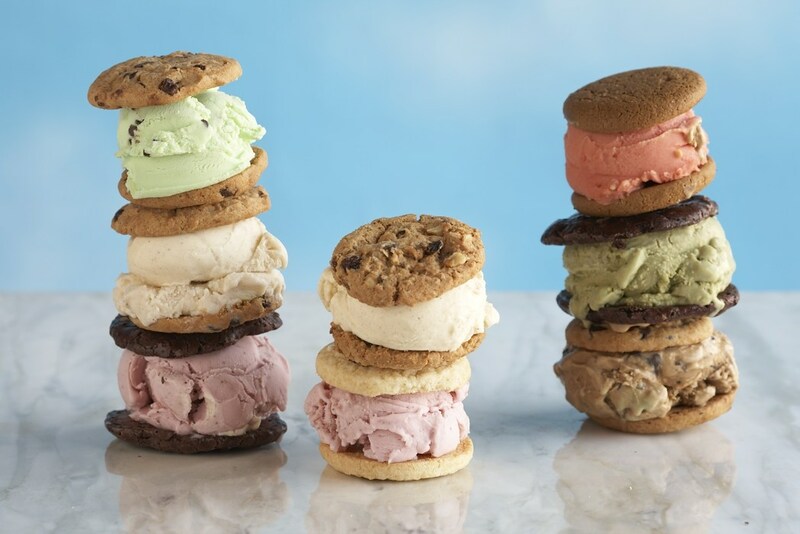 Coolhaus offers homemade ice cream and cookies in the most unique flavors. 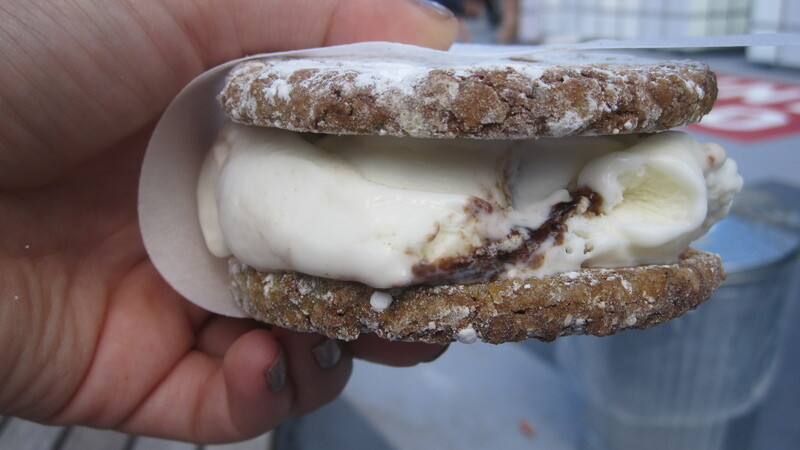 Together, they create the most insane ice cream sandwich you have ever eaten. The possibilities are endless, since the flavors change daily. You can expect about eight different flavors of both ice creams and cookies on any given day. How do you know what to expect? Just become a stalker like me, and check twitter. Some of their ice cream flavors include: baked apple, cabernet, coffee Oreo, Guinness chip, mango saffron, lychee martini, nutella toasted almost, red velvet cake batter and sea salt caramel. If that’s not enough to get you salivating, how about these cookie flavors: chocolate chip, Chocolate chocolate chip, potato chip, maple waffle, s’mores, red velvet, snicker doodle, pistachio agave, and vegan coconut almond. The only problem with all this deliciousness is actually deciding what you want! Since I want everything, always, I obviously couldn’t just get one. But, I compromised with my waistline at two: Chocolate chocolate chip cookie with brown butter and candied bacon ice cream and a vegan pistachio cookie with balsamic fig and mascarpone ice cream. Holy sweet mother of all things delicious. The chocolate chocolate chip cookie was as decadent as a piece of cake. The brown butter ice cream was sweet and subtle with a hint of smoky bacon. Awesome doesn’t even begin to describe how wonderful this was! The vegan pistachio cookie was totally unexpected. If the sign didn’t say so, I would have no idea this was a vegan cookie. Pistachios are sweet and nutty so they make an excellent cookie, and an even better vehicle for balsamic fig and mascarpone ice cream. The ice cream was tangy from the balsamic and the mascarpone yet sweet from the fig. What a unique combination of flavors. 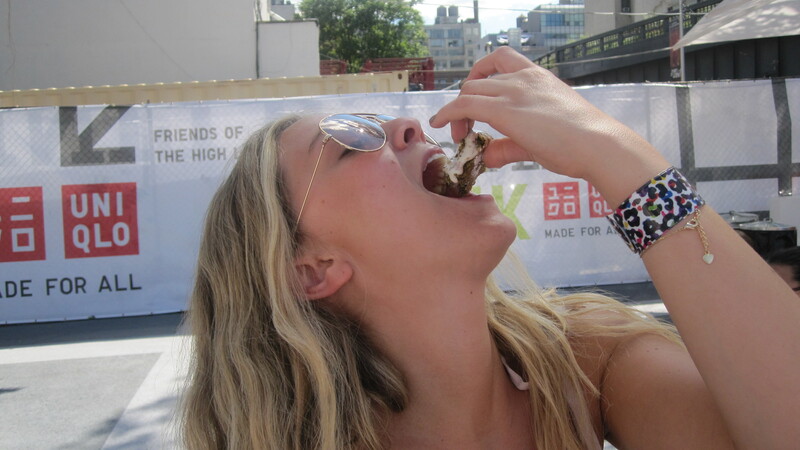 Coolhaus is so much more than creativity. They believe in quality and sustainability. So, all their ingredients are natural and organic when possible. Did I mention that the wrappers are edible? But not just edible, they are calorie free (jackpot!) and customizable with edible ink. Birthday fairy, if you are reading this, please get me a Bite-Sized Banter wrapper with an ice cream sandwich for my birthday. It’s a big one this year! For exact location, follow them on Twitter! This entry was posted in Food Truck and tagged American, Dessert. Bookmark the permalink. awesome post lys! looks divine!! thanks Gab! we have to make a trip to get these sammies together!